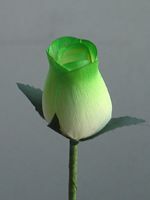 Now offering our baltic birch wooden roses in 2 sizes, petite and large rosebud. Large rose bud is approximately 2 1/2" tall, 1 1/2" wide with a 14" long stem with leaves. They are available in White, Light Pink, Hot Pink, Blue, Purple, Lemon Yellow, Yellow with Red , Deep Red, Medium Red. 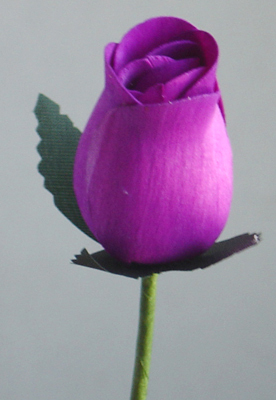 Petite rose bud is approximately 1 3/4" tall, 1" wide with a 11" stem no leaves. They are available in Deep Red, Medium Red, Light Pink, Hot Pink, Blue, Purple, Lemon Yellow, Yellow with Red. Other colors are available. Engraved may show up differently depending on the color of the rose. 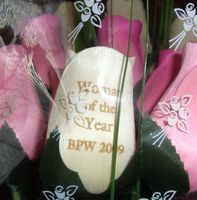 The engraving shows up more on the lighter colored roses. No ink involved in our process. The engraving can be read on the rose but does not take away from the beauty of the rose itself. 10-12 character/space limit on each line. Flowers and Wood are traditional 4th and 5th wedding anniversary gifts. Special memento for graduations, high school proms, homecomings. Great for special occasions, special events, and fundraisers too! Please contact us for pricing and delivery estimates. Please include the color, quantity, proposed engraving, shipping location, and date needed to receive a quote. Large quantity discounts available. Red - Traditional color for "I love you", Love, Beauty, Courage, Respect, Sincerity, Congratulations, Job Well Done. A single red rosebud symbolized purity and loveliness. Orange Desire, enthusiasm, fascination. Can also convey message to pursue a new relationship further. 'I am proud of you'. Peach Gratitude, appreciation, admiration, closing the deal, friendship and sociability. Pale peach rose symbolizes modesty. Pink Appreciation, 'Thank You', grace, perfect happiness, admiration, gentleness, elegance, and refinement, sweet thoughts. Pale pink rose color can mean grace, joy, gentility, and gratitude. Light pink suggests happiness and fun. Dark pink says 'Thank you', appreciation, sincerity, gratitude, and sympathy. White Purity, innocence, loyalty, silence, secrecy, reverence, humility, youthfulness, heavenly. For brides is means Happy Love. Yellow Joy, gladness, friendship, delight, promise of new beginning, Welcome Back, Remember Me and 'I Care'. Yellow roses with red tips convey friendship and falling in love. Red and yellow convey jovial and happy feelings. In Victorian times a yellow rose meant jealously. Blue Fantasy and impossibility, hoping for a miracle and new possibilities. Red and Yellow roses expresses happiness and celebration. Red and White roses symbolizes unity or an engagement. 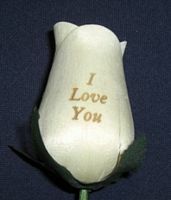 White and Yellow Roses symbolize harmony.